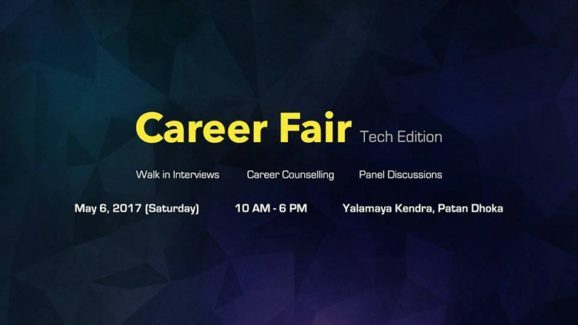 I am honored to announce that I’ll be a part of the panel discussion on “Right Skills Sets for Career in I.T.” at IT Career Fair 2017 this Saturday at Yala Maya Kendra (Dhokaima Café). The IT sector is growing at a breakneck pace. The job market is growing more competitive than even before. One might think that strengthening their hard skills – technical, tangible, and teachable skills – will be sufficient to keep them a step ahead of their competitors. Yes, technical skills will allow them to get a job. But, further personal and professional development will be difficult. You don’t want to be stuck at the level where you started, right? That is where we come in. I, alongside four other IT professionals of the country, will be sharing, what in our opinion, are the right skills set that not only help you survive but thrive in this ever-evolving field of IT. During the panel discussion, we’ll be sharing our views and experiences as entrepreneurs in the field. Hopefully, you can learn a few things from our stories, if not a lot, and apply them in your real life. We will also be taking questions from the attendees. So, if you have anything you’d like to ask, do come to the fair. I’ll be more than happy to answer your queries regarding building a career in IT. Our panel discussion will begin at 10 AM and will run for 2 hours at Yala Maya Kendra, Patan Dhoka. IT Career Fair 2017 will also feature three other panel discussions and company stalls among various other attractions. For more information regarding the event and to get your tickets, click here. Organized by Namaste Kathmandu, a visionary tech-based event management company, IT Career Fair 2017 is a unique career fair that aims at IT graduates and individuals who wish to build a career in the information technology sector. This entry was posted in Entrepreneurship, Events, Management, News, Tech News and tagged career fair 2017 - tech edition, namaste kathmandu, panel discussion by sakinshrestha. Bookmark the permalink. Next → Next post: I HAVE VERY EXCITING NEWS TO SHARE! !